Bullion is a convenient way to own precious metals. 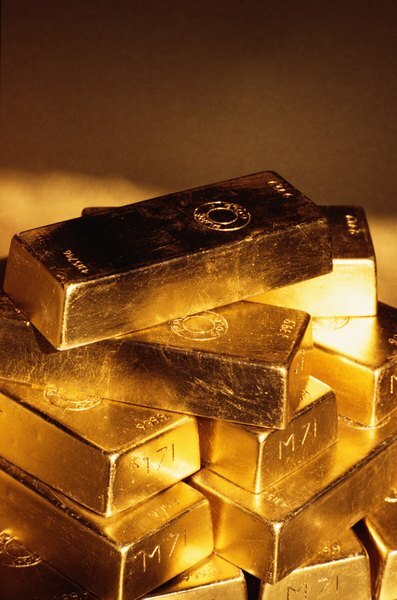 Bullion refers to precious metals as metals, as opposed to jewelry or coins. When you buy gold or silver bullion you're usually buying bars, blocks or other standardized shapes, sometimes referred to as ingots. By buying the metal in this more industrial form, you save money and come closer to paying only its "melt value." Typically, bullion is the least expensive way to buy precious metals. Kiplinger recommends paying no more than 8 percent above the price for gold on the spot market for bullion. For example, if gold is selling for $1,400 per ounce, a 1-ounce bullion bar should cost no more than $1,512. As a comparison, a gold dealer selling collectible numismatic coins at a 69 percent markup from the metal value would be asking the equivalent of $2,366 per ounce for the gold in the coins. Bullion is relatively straightforward -- you're buying a block of metal. Although the value of the work of assaying it and forming it into a bar could vary a bit, you're still buying it for its intrinsic value. Numismatic coins, on the other hand, have two factors that set their value: the worth of the underlying metal, and collectible value. Both factors can fluctuate. You can hold physical precious metals in your individual retirement arrangement. To do this, you have to set up a special self-directed IRA account that allows you to choose exactly which investments a third-party custodian buys for you with your IRA money. Once you've set up a self-directed IRA, the IRS will allow bullion that's 99.5 percent gold or 99.9 percent silver bullion to be added to your account as long as it's at a facility controlled by a third party. If you want to own bullion but you'd also prefer to a coin that you can hold, you can purchase bullion coins. A bullion coin is not designed to have any collectible value. Instead of being molded into a bar, the gold or silver is molded into the shape of a coin. Many governments mint bullion coins, including the American Eagle, the Canadian Maple Leaf and the South African Krugerrand. Some bullion coins are also produced as more expensive collectible editions, sometimes as higher-quality proofs.